KTM has just presented in Milan its new and awaited KTM 790 Duke 2018, a motorcycle of which we already anticipate some of its novelties a couple of weeks ago and from which today we have been able to see its final design, in addition to knowing all the details and technical data of this new half-cylinder naked. The 790 Duke 2018 arrives on the market with the aim of covering the gap between the 690 Duke of 73 hp and the all-powerful 1290 Super Duke R of 177 hp. For this, KTM has created its first two-cylinder engine in parallel, leaving aside the V-configuration that until now had defined the design of all the twin-cylinder thrusters of the Austrian brand. This new LC8c engine of two cylinders in parallel and 799 cc is, according to KTM, one of the most compact in its category, and is capable of delivering 105 hp at 9,000 rpm, with a maximum torque of 86 Nm at 8,000 rpm. 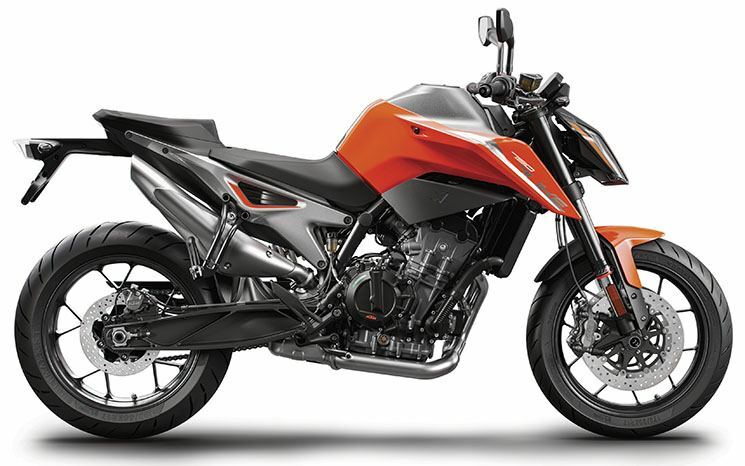 This new engine, which also functions as a load-bearing element of the chassis to save weight, only spends 4.4 liters per 100 kilometers according to KTM; In addition, the orange mark has also confirmed that it will launch a version of its 790 Duke with 95 hp as standard that may be limited to 47 hp to be compatible with the A2 card. With regard to the chassis, KTM has started from scratch and has created a tubular structure of chrome-molybdenum steel that uses the motor as a supporting element, along with an aluminum subframe. The total weight of the motorcycle, without liquids, is 169 kilos, 26 kilos less than the Super Duke R, and has a fuel tank of 14 liters. The suspensions are signed by WP, a company owned by the KTM group; in front, we found an inverted fork with 43 mm bars and progressive springs without the possibility of adjustment. Behind, a WPB gas-assisted monoshock (with extension and preload adjusters) is responsible for taming the movements of the rear end. The front brake system consists of two four-piston radial calipers developed by the KTM itself, biting 300 mm discs. Behind, a two-piston caliper works in conjunction with a 240 mm disco. 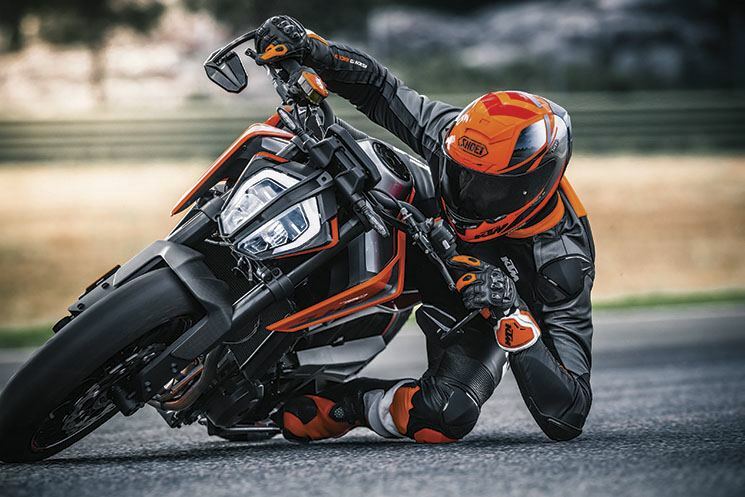 The KTM 790 Duke comes standard with the Bosch 9.1 MP unit, which in addition to conventional ABS has an ABS Cornering function with curve assistance. 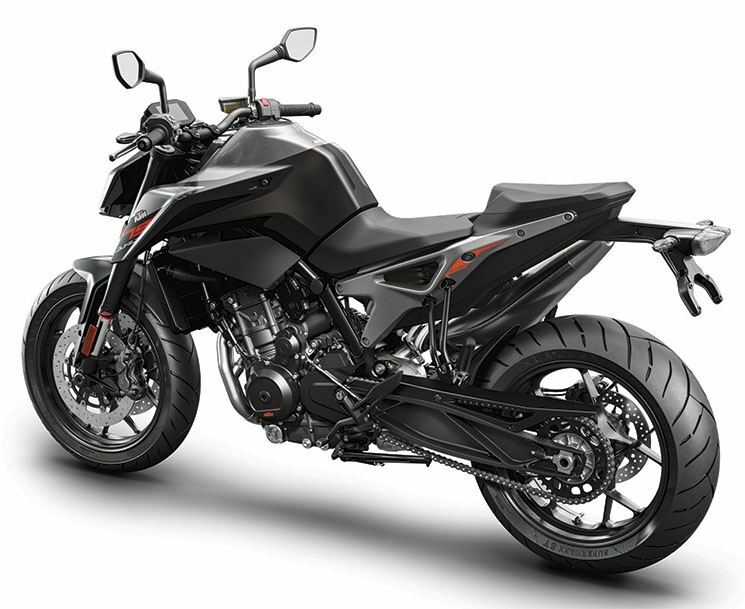 The new KTM 790 Duke 2018 has all the system of aids that we already know in the KTM 1290 Super Duke R. In addition to the ABS in curve (with Supermoto mode to disconnect it only in the rear wheel), this new Austrian twin-cylinder mounted as standard control system MTC three-level traction with Track option, the MSR engine brake regulator with 9 levels, Quickshifter + change to raise and lower gear and a Launch Control to avoid raising the front wheel in departures from stationary. The rider can choose between three types of motor map: Track, Sport or Street. Aesthetically, the 790 Duke 2018 cannot hide its sporting heritage. Exhaust, made of steel, has a revolutionary design that allows it to pass almost unnoticed along the lines of the rear subframe. In front, we find a Full-LED lens that keeps the design already seen in the Super Duke R, now sharper. 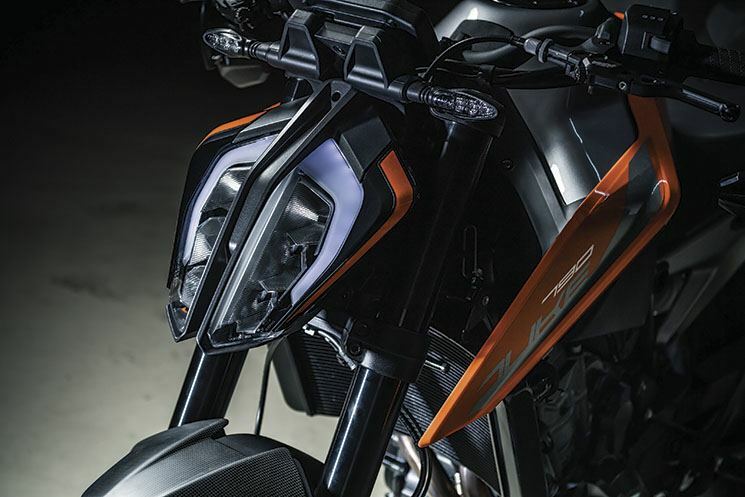 For instrumentation, KTM has opted for a color TFT screen, which allows controlling the My Ride system (optional) to manage the connection with our mobile phone, thus offering control of incoming calls and mobile audio functions.